It is easy to get caught up. Caught up in what we think is “the norm.” What “everyone else is doing.” But our families, our children, only know the norm we provide. They only know our house, our home, our traditions, our expectations. Yes, there are some external influences. Television, commercials, friends at school who share stories, and so on. But, if we prioritize and set our own family traditions and expectations based on our own values, what we love, and then truly toss the rest… then we model for our children what we want from this time of year and how to handle those external influences. 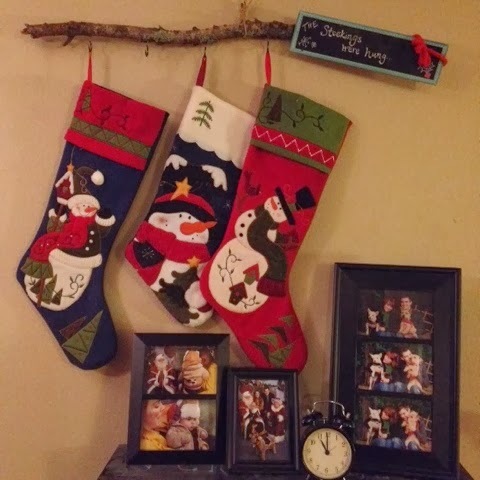 For example, our family does not fill stockings, at least not in the traditional sense of “filling stockings.” Yes, it was hard to abandon one of my favorite traditions at first. We started this as a couple in our first year of focusing on not overspending in the holidays. We decided one year to not do gifts and to only fill stockings. That did not help with the overspending goal. 😉 So the next year we did not “do gifts” for each other and filled our stockings in a non traditional sense. Each day after Thanksgiving we wrote notes. My darling and sentimental hubby further developed this idea writing his notes on slips of paper that we would later connect to make into a paper chain. We write memories, events, things we are grateful for, and things that we appreciate about each other and fill the stockings with 30 plus slips of magical paper. On Christmas morning we “open our stockings” by each reading the slips and as we read them we link them together to form a paper chain. We save the last few years of paper chains (they are on the tree all season) and on Christmas morning we add our new chain to the tree. It is the most wonderful tradition. I still miss the stocking filled with useful gift cards, small presents, and necessities. But for our kids they will not know any different. This will be our tradition, this will be what they know. You can see our red, yellow, and green paper chain from 2010 when we started the tradition, then the white chain a few branches up (kind of hidden) is the 2011 chain, the blue chain was from last year. I am so excited to get writing our links for this year! I encourage you to prioritize, decide what you really want, model these things for your children. Focus less on pleasing others or fulfilling a norm. It is so easy to pressure ourselves into meeting the needs of our parents, in-laws, extended families, friend groups, or the expectations that we believe are there for the holiday season. Ultimately you have to decide. I encourage you to pre-decide. Be proactive and not retroactive or get stuck responding/reacting without intention. You cannot anticipate all this busy and exciting season will throw your way; but you can pre-establish your own values, where the emphasis will be placed, and what you want for your time. Then put everything through that Holiday Colander. These are some of our goals, our focal points, what we have deemed as “the good stuff.” I have to run any “event,” “party,” “thing to do,” “craft to make,” “tradition to begin,” “tradition to fulfill,” “tradtion to toss,” through this syphon. We still have choices and hard decisions to make but they are much simpler with these ideas, goals, desires, and priorities in mind.